Come on everybody, let's go party at the best camping sites in the Philippines! Whether you are aiming to spend time with your special someone as well as buddies or you'd like to teach your children about self-reliance and teamwork, then don't miss spending a day/night or two over at any of these famous tourist spots in the country for a very memorable jollity. #1 - Nagsasa Cove, Zambales: Hot on the top spot for overnight beach camping, is Nagsasa Cove, located in Pundaquit, Zambales, San Antonio, Luzon. Top reasons to visit and camp there are its white sand, sparkling clean water, bonfire, trekking, snorkeling, etc. Safe for solo tourists or group visitors alike, other choices in the area include Anawangin Cove, Capones Island, and Talisayin Cove. #2 - Calaguas, Camarines Norte: A hidden paradise situated at Mahabang Buhanging, Vinzons, Luzon, is beautiful Calaguas Island. Aside from its crystal clear blue water and powdery white sand, tourists also love the stargazing there at night, and swimming to their heart's delight at daytime. Organize a DIY trip with your friends, or book a package tour for your optimum enjoyment and convenience. #3 - Thelma and Toby's Island Camping Adventure: Experience an AHA! moment, as you camp at Thelma and Toby's Island Camping Adventure, which occupies Tandan Beach, Port Barton, Palawan Island, Philippines. Look forward to one of your most relaxing getaway at Thelma and Toby's Island Camping Adventure, with no qualms but extreme satisfaction from their lovely beach, awesome snorkeling trip, pristine waterfall, superb customer service, great food, etc. #4 - Palaui Island, Cagayan Valley: Enchanting and vibrant with colors is camping experience, over at Palaui Island, just off the coast of Santa Ana, in Cagayan, Luzon. Rich marine life, breathtaking island view from the Cape Engano Lighthouse, majestic mountains, white sand, and many more wonderful things, await every weary traveler in Palaui Island; especially those searching for peace and quiet, away from the busy, stressful city life. #5 - Subic Beach and Tikling Island, Sorsogon: Another unspoiled beach for camping in the Philippines, is captivating Subic Beach and Tikling Island, which can be found in Sorsogon, Bicol, in Luzon. There are also other so many fun things to do there, such as cliff diving, visiting the Juag Fish Sanctuary, snorkeling, going atop the Lighthouse, viewing fireflies, in addition to enjoying swimming in its crystal blue water. Just make sure to bring lots of food, drinks, umbrella and other basic needs for your day trip or overnight bonding with your loved ones. #6 - Mount Pinatubo: Well-known as a hot trekking site in Botolan, Luzon, Mount Pinatubo, is an active strato volcano, which had very memorable volcanic activities way back in 1991, when its eruption’s effect was felt worldwide. 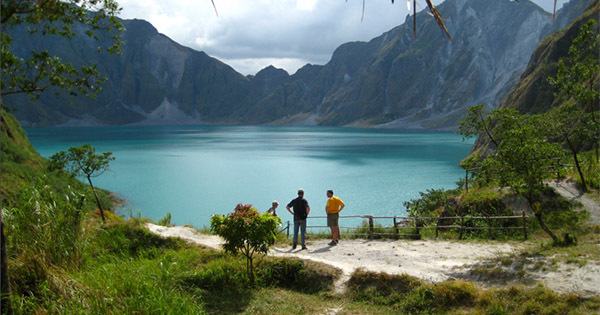 Many things to look forward to in Mount Pinatubo actually, which include the ride using a 4x4 amidst 20- meter stretch of sand around, a breathtaking view of its crater lake after a relatively easy hike, a picture perfect view at the top, etc.